But it is not working as in the link added above. Still edges are not good. Please help. The following code snippet makes the curve smoother by calculating the average of the last mouse positions. The level of smoothing depends on the size of the buffer in which these values are kept. You can experiment with the different buffer sizes offered in the dropdown list. The behavior with a 12 point buffer is somewhat similar to the Mike Bostock's code snippet that you refer to in the question. 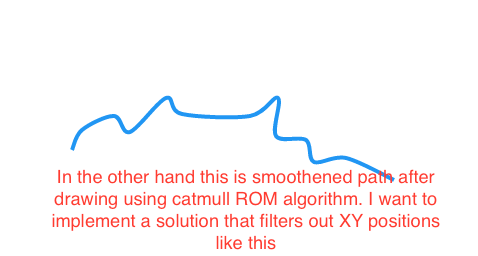 More sophisticated techniques could be implemented to get the smoothed point from the positions stored in the buffer (weighted average, linear regression, cubic spline smoothing, etc.) but this simple average method may be sufficiently accurate for your needs. 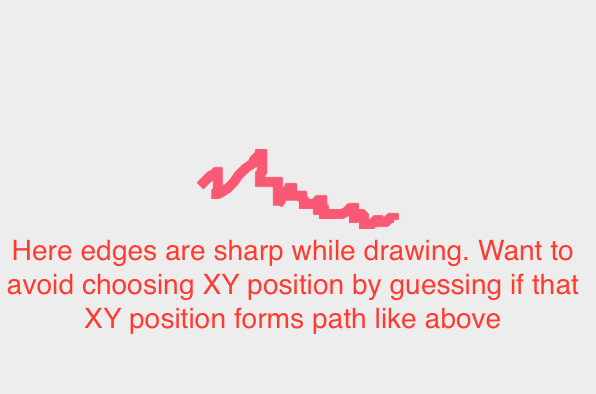 You dont have to change anything on your input for that and can only change the draw function, that the line between the points is smooth. With that the points dont slip a bit during the simplification. Is it possible to make free draw of a line in kinetic js less jerky?